Starship Troopers by Robert A. Heinlein. Good grief. This isn't fiction, it’s just bad propaganda. There’s not even an attempt at a story plot. The Caine Mutiny by Herman Wouk. Exquisite, with several very surprising (for me) turns of plot that all make perfect sense in retrospect. That Mad Ache by Francoise Sagan, translated by Douglas R. Hofstadter; Translator, Trader, an essay by Douglas R. Hofstadter. I strongly disagree with DRH’s take on translation, as explained in this book. Les Cerfs-volants (Kites) by Romain Gary. Hebrew translation from the French by Avital Inbar. Amazing that this was never translated to English (or, for that matter, produced as a film). The Wind from the Sun: Stories of the Space Age, by Arthur C. Clarke. A re-read. I remembered several of the stories, and their endings; but I did not remember how many of these actually revolved around a single punchline, and (at least in one case) are nothing more than a stale pun in the disguise of an SF story. The Communist Manifesto: A Modern Edition by Karl Marx and Friedrich Engels, translated by Samuel Moore, introduction and annotations by Eric Hobsbawm. This “modern” edition is a spelling-modernized version of the text from 1910 (not that there’s anything wrong with that). The Day of the Triffids by John Wyndham. A very obvious nod to War of the Worlds, but still a very good book in its own right. And very British. Bambi: Eine Lebensgeschichte aus dem Walde by Felix Salten. Hebrew translation by Michael Dack. The Annotated Hobbit by J.R.R. Tolkien, annotations by Douglas A. Anderson. B-o-r-i-n-g. Annotations for every trivial typo that was fixed or comma that was added between different editions of the book, but no annotations for delectable made-up words. Come on. The Waterworks by E. L. Doctorow. The actual historic facts in this book are sometimes as surprising as its fiction. Superman: Red Son by Mark Millar. Given that the Soviet Union was more than twice the size of the US, Kal El was actually more likely to land in Russia, or Ukraine, than where he actually “did”. Millar tries to envision how this mythological American hero would have developed, had he in fact landed in a Red state. It’s a brilliant premise, but I’m afraid I found the result to be sadly disappointing. Anything that’s Russian is mechanical, inhuman, and bad, with no personality. Too much like planet Camazotz from A Wrinkle in Time, except that that was written in the early 60s. Love in the Time of Cholera by Gabriel Garcia Marquez. You never visit the same river twice. Through the Language Glass: Why the World Looks Different in Other Languages, by Guy Deutscher. There are no hundred different words for snow in the Inuit languages, the Sapir-Whorf hypothesis is a joke, and anyone suggesting that language affects thought is risking violating a taboo in modern linguistics. Except taboos are rarely a good idea in science, and Deutscher presents some brilliant research results (by others) that indicate that language does, indeed, affect thought. Not in the way Whorf suggested; languages never prevent people from thinking about new ideas. But apparently, languages do make people constantly think of things that speakers of other languages don't think of as commonly. Which yields some fascinating results. The Martian by Andy Weir. At first, Weir’s fiction seems juvenile and inappropriate, which is actually perfectly appropriate as this is the journal of a young person with an immature sense of humor. A young person all alone on Mars, mind you, waiting for his inevitable death. As the text progresses and leaves the framework of the astronaut’s diary, Weir’s writing turns out to be on par with that of most SF writers. This is a good and enjoyable book. The Gremlins by Roald Dahl. Dahl’s first book. The Day Lasts More Than a Hundred Years by Chinghiz Aitmatov, Hebrew translation by Dina Markon and Amazia Porat. A burial caravan becomes a slow journey from birth (or rebirth) to burial, both of people and of a culture. Gripping and very well written, except for two things -- the badly-presented Utopian science-fiction sub-plot, and the (supposedly) censored chapter that was published after the fall of the Soviet Union. Imperial Stars, by E. E. “Doc” Smith and Stephen Goldin (volume 1 in the Family D'Alembert series). Actually, by Stephen Goldin, based on a short story by Smith. Except Goldin turned this into a ten-volume series. I was fooled into reading the first volume (I have all ten on my shelf since I’ve purchased them some 25 years ago. The wonders of unpacking after moving homes); I will probably never bother reading the rest. The title refers not to celestial stars but, as the twist in the very last paragraph reveals, to the two protagonists. Wow; can we be a bit more corny, please? Ten Little Niggers by Agatha Christie. Read a very old copy, with the original title (this was later renamed Ten Little Indians, and later still And Then There Were None). The ultimate closed-room mystery. The Art of Deception by Kevin Mitnick and William L. Simon. Written while Mitnick was still prohibited by court order from telling of his exploits, this mostly presents “theoretical” and “anonymized” cases. Fascinating at times, repetitive at others. The last chapters, providing organized advice to businesses, is boring to the verge of tears; but it was surprising to realize that my own workplace follows a large part of these rules. Boss Tweed: The Corrupt Pol Who Conceived the Soul of Modern New York, by Kenneth D. Ackerman. Purchased after reading Doctorow’s The Waterworks a few months ago; I was fascinated by this character and its story. The seemingly uncivilized state of NYC in 1860s and 1870s surprised me at first -- for example, the anti-conscription riots of 1963. But then, as I was reading the book, news arrived from Ferguson, and I realized nothing changes. Tweed’s own story is, at its bottom, a tragedy, mostly because of the unjust treatment he received from the authorities. Yes, he clearly deserved punishment, but compared to the fate of his co-conspirators, it just seems strange. Or maybe Ackerman just did a great job of humanizing and whitewashing the man. The most important book I’ve read this month, by far, is We Wish to Inform You That Tomorrow We Will Be Killed with Our Families: Stories from Rwanda, by Philip Gourevitch. At first, my impression was that this book is as important as Werfel’s Die vierzig Tage des Musa Dagh (The Forty Days of Musa Dagh). By the time I finished reading it, I realized it’s far more important than that. First, it’s one of those cases where words are worth more than a thousand pictures. The pictures they paint are very grim, but the sometimes graphic tragedy avoids becoming gross exactly because Gourevitch shuns photographs; the only illustration in the book is a map. But more than painting deep and touching pictures with his words, Gourevitch also does not hesitate to point a blaming finger. Some critics has claimed that the book is all “good-guys vs bad-guys”, avoiding any complexity. That’s not true. The book is one sided in its disdain of the killings and in its refusal to accept absurd excuses, but it clearly does provide sufficient historic background to make it evident who the read bad guys are. And it’s not who you think it is. The finger is pointed at colonial Belgium, for creating a tribal rivalry where none existed before; at postcolonial France, who protected (and armed) the French-speaking side of the conflict for no good reason; the US, for bluntly denying a genocide with weasel-words just so that they would not be compelled to intervene; and the UN and its various agencies. Specific people -- presidents, prime ministers, secretaries of state, etc. are also singled out for an attitude that would have been utterly unacceptable if the two warring sides were not so remote and un-interesting, from a Western point of view. The book is far from perfect and there is much to criticize in it, but it’s still the most important nonfiction I’ve read in a very long while. The complete Adventures of Tintin, volume 3 (The Broken Ear, The Black Island, and King Ottokar’s Sceptre), by Herge. No longer shockingly bad, these are just mediocre. A Horse Walks into a Bar by David Grossman (I’ve read the Hebrew original, סוס אחד נכנס לבר). The artist’s condition... Artists want to deliver messages from deep within their souls. To their plight, that’s not what the audience is looking for. Grossman’s new book is definitely not his best, but it’s still good. Letters of Note: Correspondence Deserving of a Wider Audience, compiled by Shaun Usher. From the banal to the profound, from the hilarious to the heart-wrenching, almost all of these 125 letters are worth reading. Based on the blog lettersofnote.com. Borderlife by Dorit Rabinyan (I’ve read the Hebrew original, גדר חיה). Rabinyan’s first book after some 15 years of silence is probably her best. The Star Beast by Robert Heinlein. Read the Hebrew translation, by Malka Friedman. We Wish to Inform You That Tomorrow We Will Be Killed with Our Families: Stories from Rwanda by Philip Gourevitch. Somebody call HBO: I just found a book that’s probably better than Game of Thrones in terms of plot craziness. A king killing his wife and the two sons she gave him, because another one of his sons (from a different wife; he had eight) convinces him of a plot. Then he kills that other son when he realizes the plot was made up. A soldier preferring to cut his left hand with his right rather than face the punishment that his commander ordered for him. In a city under siege, a mother cooking her own baby, eating half and serving half to the rebels that brought the siege upon that city. Oh, did I mention that it’s a history book? The king is Herod the Great, the dreaded commander was Flavius Josephus, and the besieged city was Jerusalem, right before the destruction of the Second Temple in 70 CE. Flavius Josephus’s Books of the History of the Jewish War against the Romans is definitely more fascinating than any history book I’ve read before, and the R. R. Martins of the modern world could easily turn any paragraph or two from it into long and gripping chapters, hundreds of pages long. Jerusalem: Chronicles from the Holy City, by Guy Delisle. Ordered after reading his account of visiting North Korea. There was something very peculiar in reading his take about my own country, or seeing known places as background plot locations. A good introduction to the sheer complexity of the situation. We Die Alone: A WWII Epic Of Escape And Endurance by David Howarth (Hebrew translation by Zvi Scholinder). The survival of a Norwegian would-be commando fighter during WWII. The complete Adventures of Tintin, volumes 4-6 (Red Rackham’s Treasure to Explorers on the Moon). I’ve never read any of this before, yet I have a very strong memory of the cover of Destination Moon from my childhood. Flavius Josephus’s Books of the History of the Jewish War against the Romans. Hebrew and annotations by Y. N. Simhoni, who translated the book in the early 1920s, but using the Hebrew of the first century CE as he attempted to re-create the original, lost edition of the book (which was written in either Hebrew or Aramic, nobody’s really certain). What If? : Serious Scientific Answers to Absurd Hypothetical Questions, by Randall Munroe. I wish Munroe would write a physics textbook for highschool. 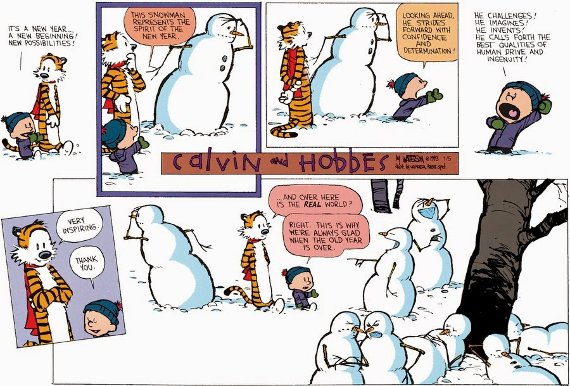 The Complete Calvin and Hobbes by Bill Watterson. Something I try to reread every few years; good for the soul. I sometimes can't resist thinking of Calvin as a real boy. He would probably be the smartest six-year-old ever, fictional boy geniuses (Wiggins) included; a literary genius, an art maverick, but also an extreme dyscalcul with severe ADHD. Today he would just have been drugged senseless in Ritalin and made into an ordinary nice boy. Hunger for the Printed Word: Books and Libraries in the Jewish Ghettos of Nazi-occupied Europe, by David Shavit. Written in a painfully boring narrative (pages upon pages of dull statistical dumps, with rare glimpses of narrative and plot). And yet, fascinating. There’s a beautiful gem of a story in this data, for a good writer to pick up. Things Fall Apart by Chinua Achebe. By pure coincidence, this should have gone public domain yesterday, if not for the 1978 copyright reform. Journey in the Month of Av by Aharon Megged. Clearly, the English title fails convey the real meaning.